Not everyone is lucky enough to be with their family this Christmas and that's the case for the 1st Battalion of the Yorkshire Regiment. An off-duty Yorkshire soldier has revealed how he used battlefield training to save victims of Saturday's terrorist attack in London. Lieutenant Jared Bambridge, of the1st Battalion, the Yorkshire Regiment, ran towards danger to tend to stab victims, saving a 51-year-old man with two knife wounds. In fact, he helped 10 of the wounded over more than two hours, as Jon Hill reports. Thousands of people turned out in Wakefield today to watch the Yorkshire regiment's 3rd Battalion "the Rifles" parade through the city. More than 150 servicemen, cadets and veterans marched through the streets to the Cathedral for an official inspection as Sarah Clark reports. 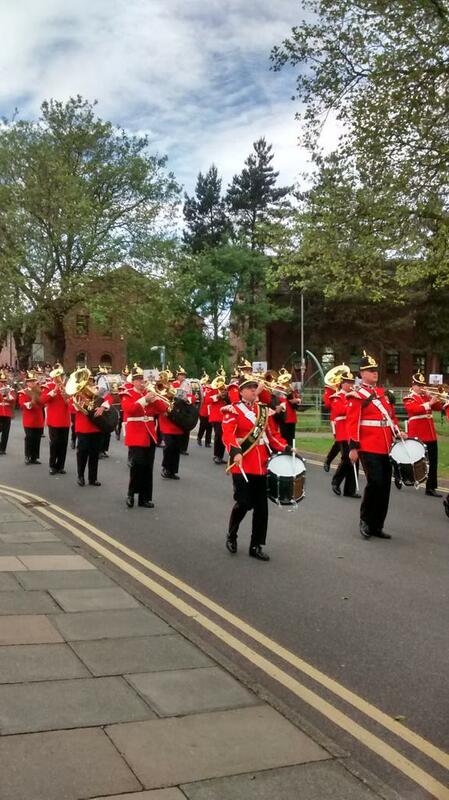 Hundreds of riflemen exercised their Freedom of Wakefield today when they marched through the city to Wakefield Cathedral with rifles at the trail, bugles sounding and bands playing. Wakefield is a heartland town for 3rd Battalion The Rifles (3 RIFLES), a light role infantry battalion which is normally based in Edinburgh. 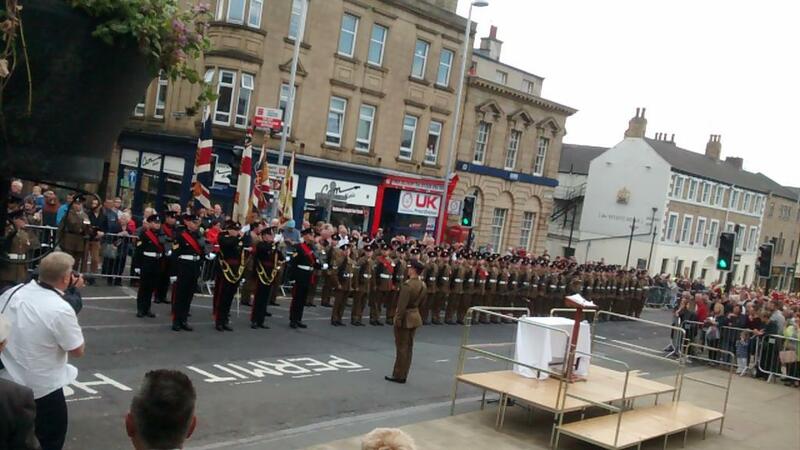 with many of the soldiers from the Battalion and their families hailing from the town and other parts of Yorkshire. Troops will parade through Wakefield city centre today. The regiment's 3rd Battalion The Rifles - granted the Freedom of the City of Wakefield in 2010 - will be exercising their right to do so. The parade of 200 troops will leave the Elizabethan Gallery on Brook Street Wakefield, leaving at 10.55am and march through the city. It will arrive at Wakefield Cathedral at 11am where a short service will be held. 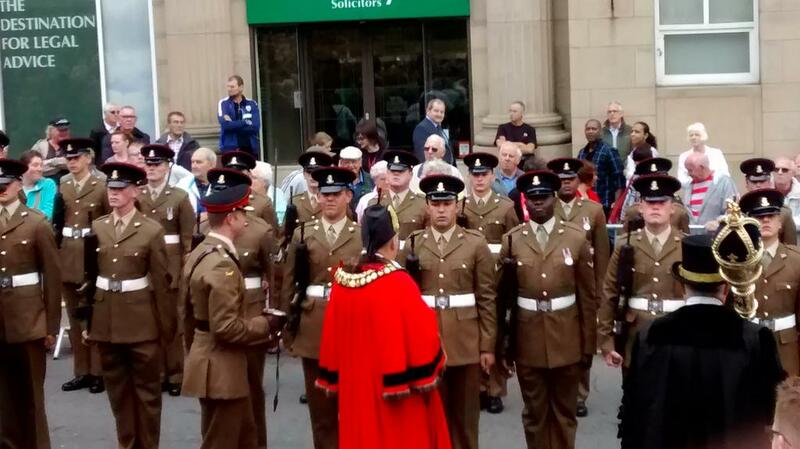 Wakefield Council leader Peter Box said: "It is a great honour to welcome The Rifles to Wakefield where they have the honour of the Freedom of the City. "The parade is our opportunity to honour and celebrate our British servicemen and women who are serving all over the world on behalf of their country. "This occasion is also a time to remember those who have died or have been injured in the line of duty." Troops from the Yorkshire Regiment are among the first British forces to be equipped with new laser guided guns to help them identify targets more clearly. The regiment like many others has paid a heavy price in the ongoing conflict in Afghanistan. Now the Government has spent more than £50 million on the new equipment which can pinpoint the enemy half a mile away. Katie Rowlett joined the troops as they were put through their paces with the high tech kit which for them could mean the difference between life and death. A team of thirty men and women from Yorkshire have been helping to train Ugandan soldiers in East Africa. The team led by Reservists of the 4th Battalion The Yorkshire Regiment spent two weeks working in temperatures of up to 32 degrees celsius. Their roles varied from testing the Ugandan People’s Defence Force before it crosses into Somalia to run peacekeeping operations, to assessing how the soldiers deal with suicide bombers. They've also helped to teach 1,900 members of a Ugandan Battlegroup about counter-insurgency techniques. Most of the Yorkshire team have civilian jobs but have given up their spare time to train and serve as Army soldiers. The families of the fallen soldiers speak after the verdict. An inquest today ruled that four soldiers from Yorkshire, and two of their comrades, were unlawfully killed.